Yasmin finished studying Massage therapy 4 years ago, in 2015, but started with Health Span while she was still in school, so we are lucky enough to have worked with her for 5 years. She has always brought a gentler touch to her practice, making her an excellent therapist for clients that need to feel restored, nurtured and taken care of. Coming from Columbia 7 years ago so that she could be with her husband we are super excited to celebrate with her next week as she officially becomes a Canadian Citizen. It is a reminder to me as a person and as a business owner how very blessed we are to live in a country that not just welcomes immigrants but gives every opportunity to new arrivals to find a life that gives them joy, abundance, balance and prosperity. Mashsage Therapy in Calgary is a competitive business and it helps to work with people that you love and who understand and celebrate your strengths. Yasmin wanted to be a Massage therapist because improving the health and wellbeing of her clients is important to her, and she understands that massage not only can soothe sore muscles but can relieve the stress that sometimes can be overwhelming in life. 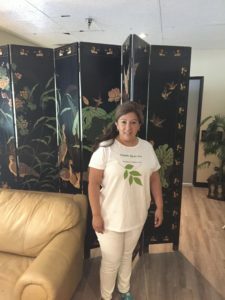 She also specializes in Lymphatic Drainage massage, which is an amazing treatment after surgery, or during treatments for Cancer that can cause swelling and loss of energy. She loves working with female clients that have a need for balance and restoration, and loves working with Health Span because it allows her to express her talents, her professionalism and her skills the way she feels is best, and we are super flexible with schedules, and as a mom and someone very involved in her church a flexible schedule is really important. If she couldn’t be a Massage therapist she would express her skills of making people feel great through hair and fashion design. Please join us in celebrating her new citizenship!